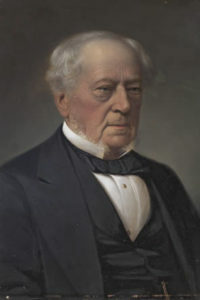 Born in Halifax, West Yorkshire, Shaw studied at Caius College, Cambridge, and became a doctor, and later a Fellow of the Royal College of Physicians of London. After a period in Manchester, where he became a Member of the Manchester Literary and Philosophical Society, he moved to Leicester and established a medical practice, presumably from his home at 20 New Street, St Martin’s, while hoping for the possibility of an opening at the Infirmary (which he did not in fact achieve for several years) . In the Spring of 1835 he and Alfred Paget joined together about the possibility of establishing a Literary and Philosophical Society to draw its membership from both sides of Leicester’s deep political and religious divide during the period of national and municipal political reform. This cooperation between the two was symbolic of what they were seeking to achieve as Shaw was a Churchman and a Tory, while Paget, like most if not all of his family, was a Liberal and a Nonconformist committed to radical reform. The two brought together a dozen or so leading figures of the town, again from both sides of the divided society, who supported the project, and the Leicester Literary and Philosophical Society was dull established along the lines of the Manchester Lit and Phil by July 1835. It was hoped that Sir Henry Halford Bart. Of Wistow Hall, Leics., the King’s Physician, would accept the Presidency of the new organisation so Shaw was elected ‘Acting Chairman’ while Paget became the Secretary. However, Halford twice refused and Shaw remained Acting Chairman through the first session of the Society. A frequent Lecturer at the Society’s meeting, he was elected President for the Society’s fourth session, 1838-39, and on three further occasions, 1845-46, 1850-51 and finally for the Society’s 50th anniversary year of 1885-86, by which time Shaw was over 84 years old. He died in Leicester aged 87 in 1888.